“So what did you have for dinner?” When I was a kid, this was one of the typical topics of conversation with my friends. 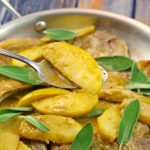 I used to love to say, proudly, that I had ‘Pork Chops with Apple Sauce.’ I guess I liked saying it because it sounded so much fancier than the usual fare. And it wasn’t just meat – it was a meat with a sauce. However, it was the more exotic “Mutton Chops with Apple Sauce” that I longingly yearned for. Yet, I didn’t get to try lamb until I was in my 20’s. It was not what I expected. I actually had no idea what mutton was, but I wanted it. I wanted it mostly because other people had it and I didn’t. And it sounded just that much more glamorous than pork chops. Growing up, we didn’t eat a lot of fancy stuff. 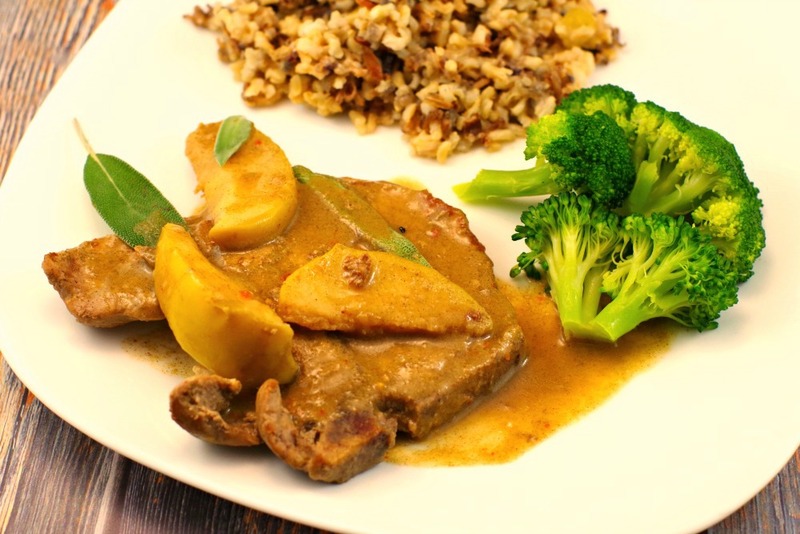 Pork Chops with Apple -Sage Sauce served with fresh broccoli and wild rice. Over the course of my life, I have eaten my share of really gross things. I believe that is a sign of life well lived. In addition to lamb, I have tried cow tongue, tripe, spam, snails, vegemite, canned asparagus, pickled eggs, pickled herring, frog legs, chickens’ feet, shark, along with several unidentifiable foods at various Dim Sums. Yet, not every disgusting food experience elicits the same intense revulsion. Lamb is currently leading in the gross food race. Yet, it wasn’t just about the taste of the lamb- it was the smell I couldn’t shake. Both taste and smell play a huge role in the taste of food. And although each sense has its own receptor organs, both senses are intimately entwined. And smell is actually our strongest sense when it comes to emotion in memory and is extremely powerful in relation to food. 25 ish years later, I cannot smell lamb without some really bad accompanying flashbacks. I have used the terms lamb and mutton interchangeably because they are both the meats of domestic sheep. However, there is a difference. Mutton is actually the meat of the adult sheep and lamb is the youngin’. It was lamb I ate that night, which is more expensive and supposed to be superior to mutton. I can’t even begin to fathom how mutton would have tasted. I am sticking with pork! 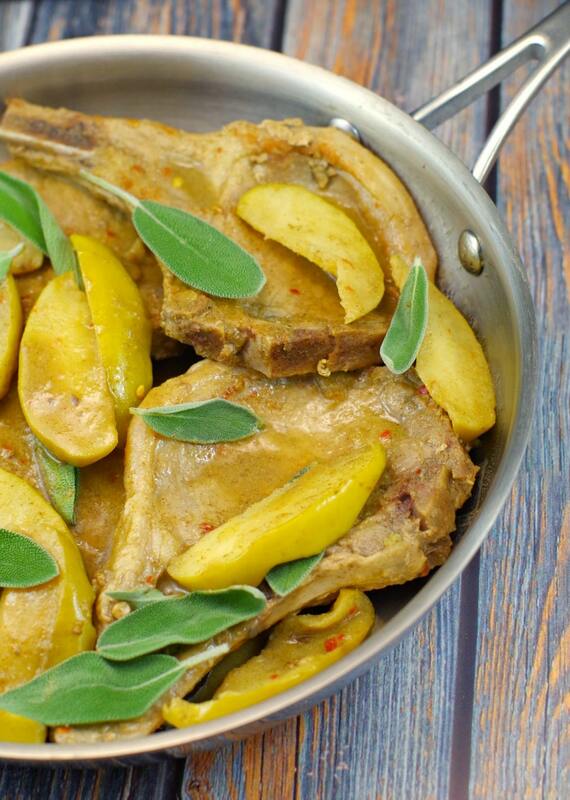 And so on that note…here is an amazing Pork Chop with Apple-Sage Sauce recipe. 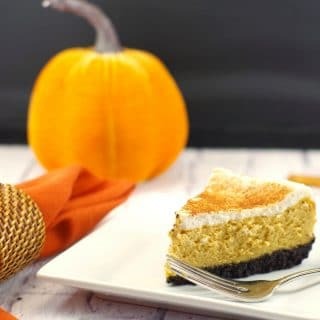 This is one that you will want to make for dinner! It’s another one of my favourite go-to dinner recipes that can be made in under 30 minutes, so it’s a healthy and quick dinner that’s realistic for a weeknight. So, if you are looking for easy dinner recipes that are a little fancier than the usual fare, this is the one. Hey, it’s meat with a sauce! Follow my “30 Minutes or Less” board on Pinterest for many more time saving recipes! 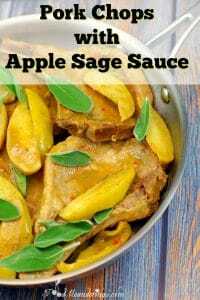 Sage and apple are a perfect pairing in this quick, easy and delicious pork chop dinner than can be made in under 30 minutes! Cut apples into quarters, then slice out the core. Cut into thick wedges. Melt butter with garlic in a large non-stick frying pan over medium heat. When bubbly, add apple. Turn occasionally, until golden on both side, 2-3 minutes, then remove to a small plate. Add pork to pan and cook until browned, about 3 minutes per side. In a bowl, stir juice and Dijon mustard and seasonings. 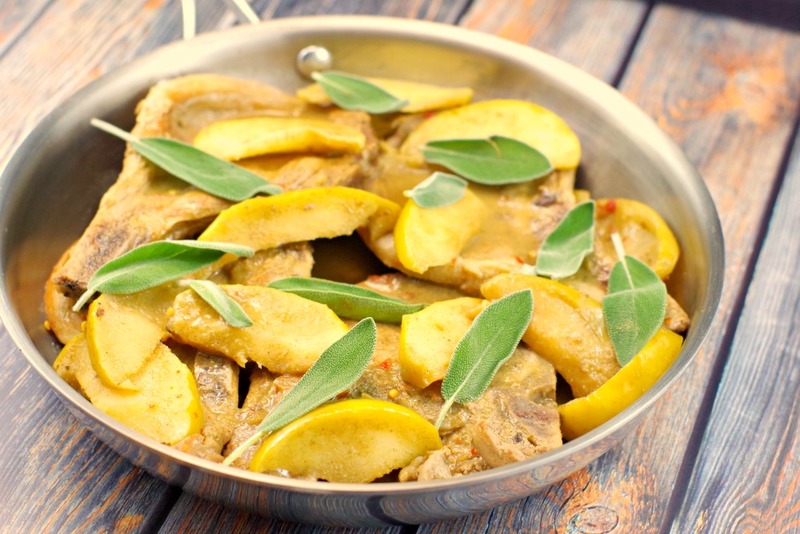 Remove pork and apples from pan and place on plates. Boil sauce, stirring often, until as thick as you desire, 3 to 5 minutes. Pour over pork chops and apples. Thanks – it is very yummy! I agree – must be a personal thing like cilantro! Thank you and yes, fancy isn’t always what it’s cracked up to be, is it?! I forgot to mention caviar in my list haha…. There is a reason why apple with pork is such a classic combination! The sage leaves make yours look very pretty! I was amused as I began to read about your desire for mutton, expecting the outcome to be much as yours was! Lovely recipe. I made it, omitting the apples, the other night and the combination of sage and pork was divine. I’d not thought about using sage this way, and now it’s a keeper. I made it with these Brussels sprouts https://frugalhausfrau.com/2017/02/20/cream-braised-brussels-sprouts/ and it was a heavenly combination! So glad you liked it! And those brussels sprouts look so good too! Pork chops and apple sauce was a kid favourite meal. This recipe is all grownup. Looks great. Boy would I love to come home to this meal after a long day. Nice post. Thanks.. I agree – I make it ahead sometimes, then I’m guaranteed to come home to it! This was so good! we had it last night for dinner and loved every bite 😉 Your food list is so interesting! I agree…you need to try many different things to actually have a full culinary experience. I think the strangest thing I have ever eaten is definitely deer heart. I can’t say I would eat it again (it’s really gamey) but I never regretted trying it.